cheese. Aroma of Auto Cheese: sweet, pine and pleasant. Taste of Auto Cheese: mostly smooth, a little bit sweet and pine. Effect: strong euphoria. You will feel relaxation and bliss, but your mind will remain clear. This effect lasts for several hours. Neurobioligists Neuro Seeds made this strain to be preferable to ease blind headache, to cure depression and chronic pain. 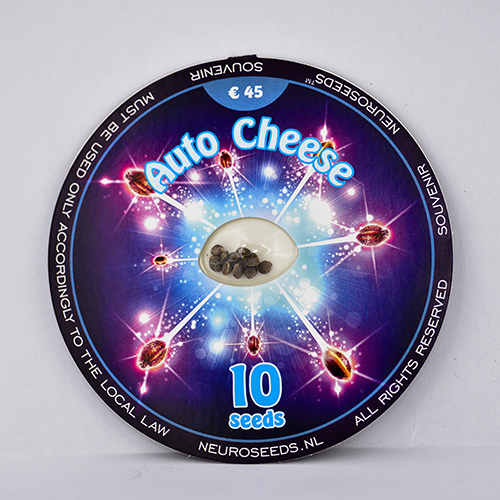 Auto Cheese does not require special light circle and it will be ready in 68 days; that is why you will be able to harvest several times during a growing season.